I’m always amazed with the evolution of web applications. Ages ago, we used to rely on RSS and everyone seems to have his/her own Google Reader to keep up with recent updates of news, blogs, and so on. At the same time, email notifications were widely used too, even until this day. A lot of blogs actually rely on email subscriptions to notify users of new posts. Then few year ago, Facebook and other social media came as a platform for sharing anything on the internet. Almost all bloggers have their own dedicated Facebook page. Even I want to make one, but I know I won’t be very “diligent” in making it growing. So I leave this idea to rest. Now, slowly one by one, websites are starting to adopt push notifications. Readers can subscribe to the notifications and they will get notified whenever there are new new posts from the websites. It’s an interesting concept! Chrome and Firefox browsers support this feature, while Microsoft Edge and Safari will follow suit. I am now trying some push notification services that are available free of charge in the market. I am currently eyeing for OneSignal and I hope I am making a good decision to adopt it. Stay tuned! Today was my first day at the headquarter of SWIFT, the company where I work at. The HQ is huge, with a big park inside the complex and small streams. There are different buildings scattered across the complex. They are really beautifully designed. The interior has different themes and design: contemporary, nature, zen, and vintage. I wish I can post the pictures here but I’m not able to due to security reasons. You won’t be able to get the same price outside. 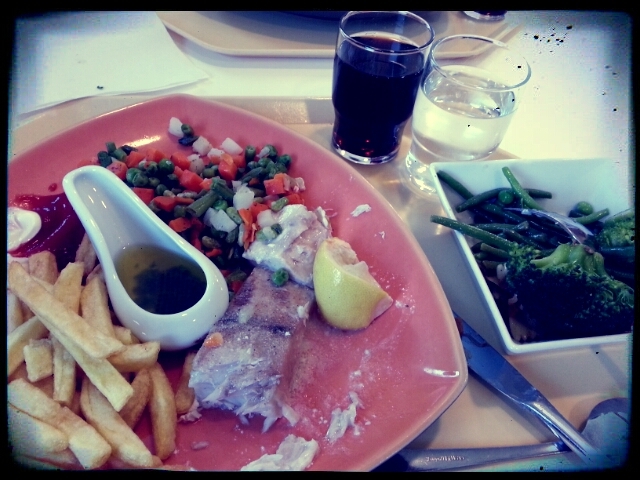 This sort of meal should cost me more than 10 euros outside. It feels so good to be back. It really is. Despite the cold weather and the gloomy sky, Brussels brings back the good memories of living in Europe for 3 years. The leafless trees occupying the stretch of streets, old buildings that are well maintained, cycling, wearing boots,… ah, I can’t deny that I miss it very much. I still can’t believe that I’m back here! Well, temporarily. The new company I work at (yes, I have resigned) requires me to go to Brussels for training. The headquarter is located in a small town just south of Brussels; this is the reason why I’m here in the first place. I am very lucky to be able to go here for free. Although I’m only going to be here for two weeks, I’m planning to cross the border to the Netherlands and visit my good friends in Eindhoven during the weekend. I can’t wait to see them again! But Gotama would claim that he did find a way out and that Nirvana did, therefore, exist. Unlike many religious people, however, he did not regard this panacea as supernatural. He did not rely on divine aid from another world, but was convinced that Nirvana was a state that was entirely natural to human beings and could be experienced by any genuine seeker. Currently reading Buddha by Karen Armstrong. Hiking at Bukit Tabur from Amalia on Vimeo. This was my 6th visit to Bukit Tabur. I still can’t believe that this beautiful hill is just less than 30 minutes from the center of KL. It is definitely a challenging hill to hike, as you need to climb the rocks and walk along some dangerous vertical cliffs. But it’s so worth it and I love it. Yet home need not always be a place. It can be a territory, a relationship, a craft, a way of expression. Home is an experience of belonging, a feeling of being whole and known, sometimes too close for comfort. It’s those attachments that liberate us more than they constrain. As the expression suggests, home is where we are from – the place where we begin to be. Rather than learning to live away from home or do without one, global leaders must learn to live in and between two homes – a local and a global home. Become familiar with local and global communities, and use neither to escape the other. This takes physical and emotional presence. It requires staying put long enough and traveling a fair amount. Spending time with those who live nearby and staying close to those who are far away – showing and being shown around. Leaving a piece of heart with people and places, and keeping them in your heart wherever you are. Hard as it may be to reconcile local and global homes, it is a privilege to have a chance to inhabit both. A privilege that we must extend to others. That is, ultimately, the work of global leaders – connecting those homes within and around them. 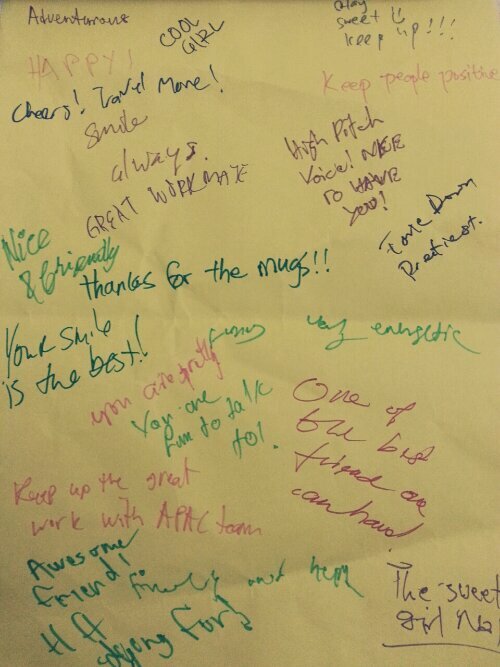 These words are written by my colleagues during our 2-days team building event in Kampar, Perak. Each person had a paper sticked on his/her back, which can be written by others. It was a fun event full of craziness & adventure. I wish it could be much more adventurous though 🙂 I enjoyed it so much. For the first time of my life, I didn’t feel lonely. with the pain of separation. I need to go beyond the inner me to win this battle.